The DA has won the overseas vote by 7581, COPE got 918, ANC only got 673 out of the 9857 that were cast in total. That only leaves a maximum of 622 for the VF+. They must be pretty annoyed after all the effort they went to. It does mean that the DA secured 77% of the expat vote and can now change the Constitution of Putney and Wimbledon. Or something. Anyway, now the DA can add those 7,581 votes to the approximately 1,200,000 they had about an hour ago. “Drop in the ocean” or “Viva Democracy, Viva!!”? Or perhaps a bit of both? Incidentally, I make that a 60.5% turnout overseas in comparison with 77% here in SA, which I find strange after all the court cases, acrimony and the effort that people had to make to register. Rather apathetic. Which is only one more letter than this whole ex-pat voting saga has been from the start. 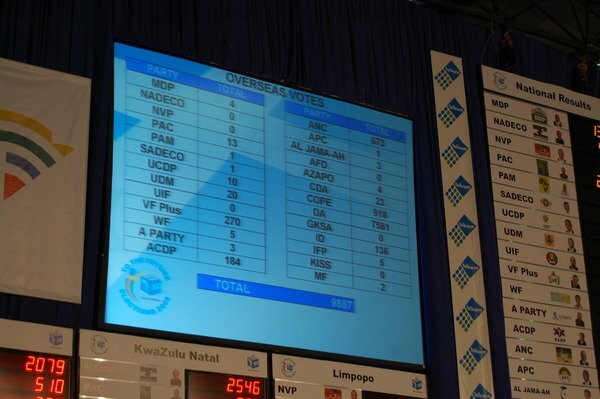 EDIT: Here’s a snap of the IEC’s overseas election results board. VF+ only polled 270 votes. Oops! Author 6000Posted on January 27, 2009 January 29, 2009 Categories annoying people, emigration, in the news, politics, this is south africaTags elections, expats, voting rights56 Comments on Should Expats be able to vote?